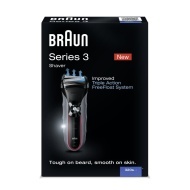 alaTest ha raccolto ed analizzato 36 recensioni su Braun Series 3-320. La media della valutazione per questo prodotto è 4.0/5, confrontata con la media della valutazione di 4.3/5 per altri prodotti. Abbiamo analizzato differenti valutazioni di esperti ed utenti, età del prodotto ed altri elementi. A confronto con altri prodotti, Braun Series 3-320 ha ottenuto un alaScore™ complessivo di 82/100 = qualità Molto buono. Good Value, close shave, seems well made. Does not give a close shave. I previously owned a 1-series Braun which I thought was quite good. When it broke down after 3 years I got this one. It is loads better - a lot smoother, quicker and gives a close shave each time. I am really pleased and would recommend to anyone! The Braun shaver is excellent, its smooth to shave with and no irritation, it charges quickly 1 hour charge and 45 minutes use, enough for 2 shaves, it's easy to hold and easy to clean. This a very easy to use shaver, and gives a decent shave. I've not been comfortable with using twin foil shavers in the past as they weren't easy to manoeuvre. However, this one is fine as the shape makes it easy to control. It's easy to clean as well. Very pleased with the shaver. Nice design, easy to use, close & comfortable shave. I used to cut my skin with other shavers because my skin is sensitive but I have no problems using this shaver. Would recommend to all.